Stream bank erosion is a dynamic and natural process as rivers meander across their floodplains. However, human influence through catchment development, stream regulation, removal of large wood, and clearing of riparian vegetation, can greatly increase the rate of bank erosion, sometimes to unacceptable levels. Rapid bank erosion leads to loss of valuable land, reduced water quality as sediment and nutrients enter the stream, as well as threatening infrastructure such as roads, bridges and buildings. 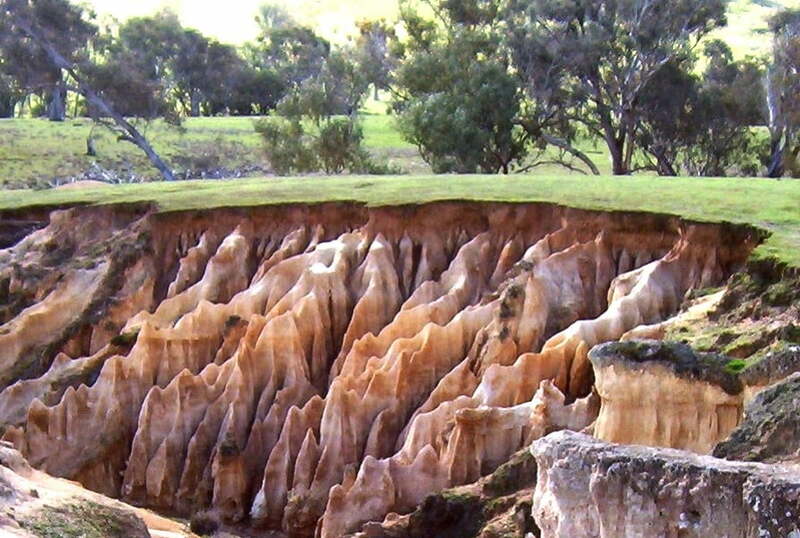 Stream bank erosion is the dominant source of sediment in many river systems, and sediment loads in Australian streams have generally increased by 10 to 15 times in comparison with pre-European loads in intensively used river basins (National Land and Water Resources Audit 2002). There are three main processes that cause bank erosion (scour, mass failure and slumping), and it is essential to determine which are operating at any particular site because the management required to slow or prevent them may differ. The relative importance of the three erosion processes often varies with position in the catchment. Maintaining healthy vegetative cover on the bank itself, and along the top of it, is one of the cheapest ways of slowing the rate of bank erosion, but sites with a high risk of erosion (sub-aerial erosion, mass failure, fluvial scour) and high stream power may require in-stream works to, for example, protect the toe of the bank. Given the importance of vegetation in slowing bank erosion, control of grazing animals if often the first step to improved management. Rainfall over much of Australia is highly variable by world standards. The combination of large catchments and periodic large rainfall events means that flood flows are not uncommon. A flood occurs when water goes over the top of a stream bank and out of the channel. Human activities such as clearing catchment and riparian vegetation, constructing weirs and impoundments, and removing large woody pieces from the channel, can all influence the frequency, duration and level of floods. 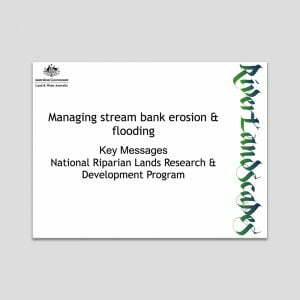 With the current interest in riparian rehabilitation, the effects of revegetation on flooding also needs to be understood at both a catchment and a reach scale. 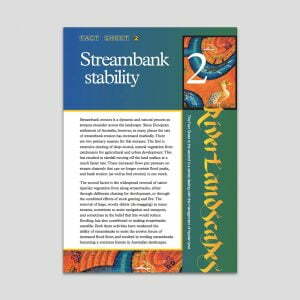 RipRap 10 — Streambank Stability: why, what, where & how?